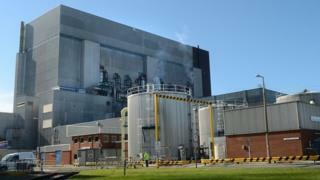 A reactor at a nuclear power plant in Lancashire has been taken offline due to a technical fault. EDF Energy, operators of Heysham Power Station in Morecambe, said one of the two reactors at the Heysham 1 site was closed down on Tuesday. A water leak had been discovered in a turbine at a non-nuclear part of the plant, a spokesman said. He added that the plant was taken offline as a precaution but could not confirm when it would resume. The Heysham plant was previously closed in August 2014 following a routine inspection which discovered a fault. A reactor at the site was also closed in May 2013 after smoke was seen coming from the plant. EDF operates eight nuclear sites across the United Kingdom.